Accudata’s new GVM-10 Seismograph now makes the job of monitoring a quarry blast and air over-pressure a very straightforward task. The new seismograph has been designed for extreme ease of use. Just switch on, press one button and the GVM-10 is ready for the blast. It’s so easy, that the user guide is less than a page in length. The blast and over-pressure are recorded on an SD card, so no more hassle trying to connect to a computer. The analysis software, supplied on a memory stick, is also freely available from Accudata’s website should you mislay the original. The Accudata GVM-10 is not only very well made and durable but it’s also one of the most accurate seismographs currently available anywhere in the world. It is designed to ensure full compliance with BS7385-2:1993. The build quality of the Accudata GVM-10 is immediately obvious, as is the custom designed carrying case complete with all the accessories, comprising: tri-axial geophone pack, three ground spikes, air over-pressure microphone with tripod, battery charger, full manual & software on a memory stick, together with a calibration certificate from a fully accredited independent laboratory. Full details and specifications are shown on our website: www.accudataltd.co.uk. 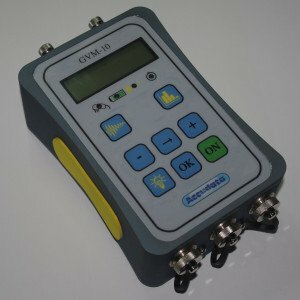 This all new Accudata GVM-10 is now available to order with next day delivery often possible.